These last September school holidays, we stopped overnight at Albury to break the drive from Sydney to Melbourne. 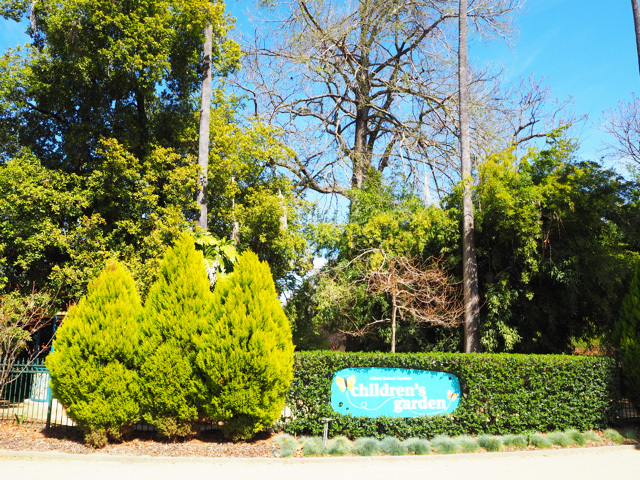 We had a lovely stay overnight at Quest Albury Townsend and headed to the Children’s Garden set in the beautiful Albury Botanic Gardens. This gorgeous Children’s Garden designed by Mary Jeavons is a place where children can enjoy learning about the environment in a safe, creative and fun way, stimulating their imagination and providing a sense of wonder. This fully fenced Children's Garden will stimulate children’s senses through imagination, observation and play. 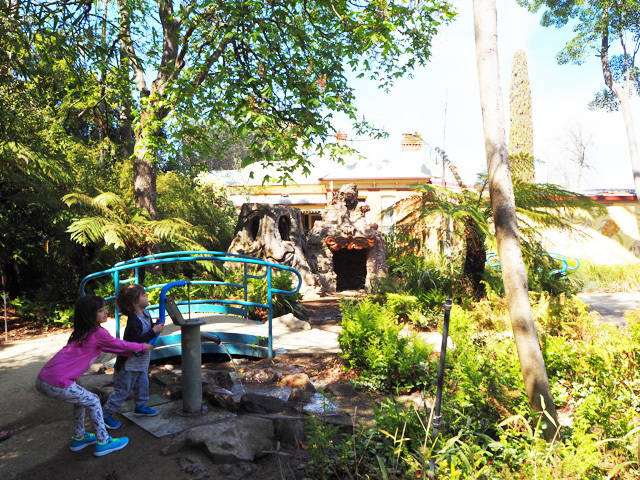 Kids can follow trails around the garden to explore and discover a wonderful array of items. Little Miss and Little Mister loved the life sized dinosaur and especially the baby dinosaur at the entrance. There is a castle themed toilet nestled next to the bamboo forest (where kids can explore). This castle themed toilet is quiet interesting but very useful with children and adults toilets and change table facilities. The latest addition to the Children’s Garden is the treehouse which will consist of multi-level decks, ramps, rope ladders and steps, leading to a top platform and covered by an all-weather thatched roof. The structure is supported by natural timber bush poles, with artistic toppings and will be surrounded by a sandpit, garden beds, rock features, soft-fall areas and timber seating. It wasn’t opened when we visited however it is almost finished. Highlights include a life-sized dinosaur with interactive speaking tubes, carved animals, living cubbies, a fairy temple, a willow dome, a throne, a water play area, a wetland, dinosaur eggs, a creek line, troll cave, musical instruments, murals and more. The Children’s Garden at Albury Botanic Gardens is a gorgeous spot in Albury where children can discover, wonder and enjoy. Make it a must stop when you’re visiting Albury next. For more information and opening times to the Children's Garden, head to their website. There is also the nearby Oddies Creek Park which is an inclusive play space which caters for all ages and abilities which also features a flying fox, basket swing, toilets, BBQ and picnic area, musical sculptures, sandpit and climbing walls.